Oliver had his first full day at Apple Blossom Beginning's on Monday. We've warmed up with three one-hour playdates while I hung out. Then two half-days where I left, and one of which I put him down for a nap during. Finally, Monday was his first full day. He cried when I left, of course, as he cried every time we've gone. But he lasted the whole day, and even took an hour nap. The "aunties" are really quite loving, and the other kids are sweet, so I think soon enough he will love going. He'll be going three days/week - Mon, Weds, Fri. I pack two snacks and a lunch for him every day, which is some stress, especially after observing a few days and hearing a lot of "I'm sorry, your mommy didn't pack such and such today..." But for now, it's just fine. They also take a nap together in cribs all in two rooms. I think sleeping with others will take some getting used to, so his naps are more like an hour instead of two, but I think being flexible about sleeping in the room with others will be a benefit in the future. The cabin kid's room comes to mind. 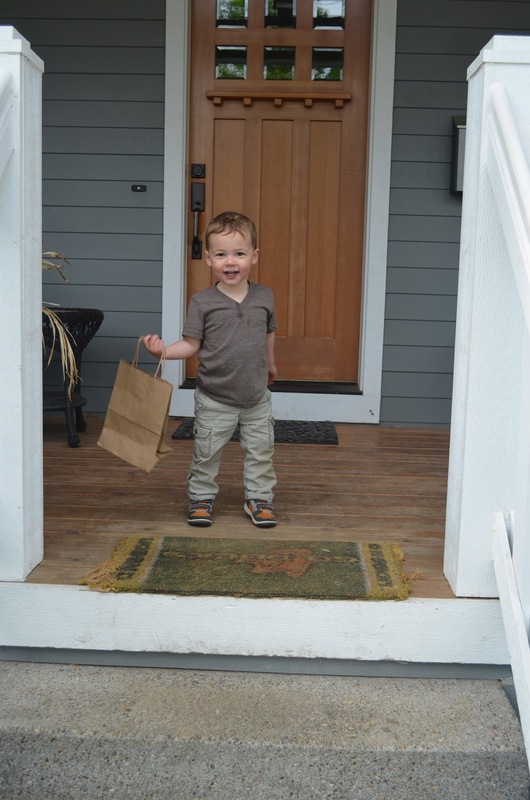 It's a bit sad to be changing up our routines, like not going to Stroller Strides as often, and not being as flexible for drop-in visits from grandparents. But, Oliver is really going to enjoy the extra social and activity outlet. And I know I will find plenty of activities to fill my time! He has gotten so active and restless that it's hard to fill the day with enough, so this will be good for everyone. We had to move our Monday swim class to Wednesday at 4:30. I'm sad to leave our friends in that class, but the Wednesday class is more advanced and pretty cool to push his skills to the next level. It's a transition class, which means at the end, I won't be going in the water with him anymore! There are a couple kids that are 2-2 1/2, so he's younger than most of them, but he seemed to be keeping up with the more advanced kids. They were already doing a lot of listening to the teacher at the last class. It was amazing. Oliver was being a bit rebellious at first (jumping in the water when it was someone else's turn), but I was strict with him (after being told to be :) ) and the teacher gave him a talking-to, and he listened well after that. It was a bit inspirational for the rest of his life, and he's starting to actually swim on his own now. Obligatory First Day of School photo. Empty paper bag has no explanation. Sadly, then I have to confess how Monday ended after we got home from Apple Blossom. Oliver was excited to go outside to play, and when I went to grab my water and his snack inside, he managed to fall over while trying to get onto his riding truck. Unfortunately, he landed his poor little forehead on the cement step. 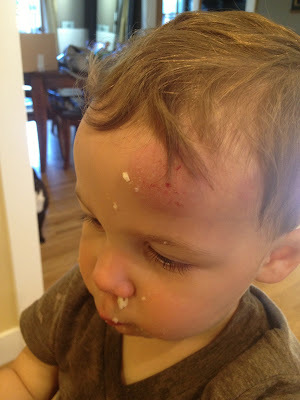 Ugh, a trip next door to the neighbor with two little boys who have a history of injuries, and a call to the doctor, and it was determined that he would be just fine, but what a nasty bump on his head! Today the swelling went into his eye more and it looks pretty terrible. But, so glad he will be fine. And fearful that this is just the beginning of it all! War Wound! No boogers, just oatmeal. Hopefully Apple Blossom is going well today and he'll have a good time. And no more injuries this week! Now, I must actually get some work done. Off to perfect my business plan!